The chaos spread by the self-proclaimed Islamic State across Iraq, further fragmenting that already fragile state, inadvertently redounded to the benefit of the Kurdish population. This presents the Trump administration with a quandary: Should the United States support or oppose long-frustrated Kurdish ambitions for statehood? The Kurdistan Regional Government (KRG), which already enjoys autonomy from Baghdad, took advantage of the initial reverses suffered by Iraqi forces since 2014 to expand its sphere of territorial control by roughly 40 percent. Most notably, the KRG asserted control over the oil-rich province of Kirkuk, which has long been contested by Kurds, Turkmen, and Arabs. Then, on September 25, the KRG, under the leadership of President Masoud Barzani, staged a referendum in which 93 percent of voters opted for independence from Iraq. It now appears, however, that the KRG’s reach has exceeded its grasp. Its independence bid has united its neighbors—Iraq, Turkey, and Iran—against it. Turkey and Iran, which have their own restive Kurdish populations, have closed their border crossings with the KRG to signal their displeasure, and Iraqi Prime Minister Haider al-Abadi, acting with Iran’s support, ordered the Iraqi military into the disputed province of Kirkuk. On October 15–16, Iraqi army units, along with the Iranian-dominated Popular Mobilization Forces, entered the city of Kirkuk and surrounding areas to reclaim them for the central government. By the end of this operation, Iraqi forces seemed to control more territory than they had prior to 2014. With Iranian help, the Popular Mobilization Forces have become a powerful militia. The Iraqi military offensive met little resistance. Baghdad had negotiated entry for its military forces with the Patriotic Union of Kurdistan (PUK), one of the major KRG political parties, whose peshmerga held most of the ground in and around Kirkuk. The PUK is congenitally suspicious of the other major Kurdish party, Barzani’s Kurdistan Democratic Party (KDP), which took the lead in sponsoring the independence referendum. While PUK fighters pulled back without a fight, there were reports of skirmishes between KDP-affiliated peshmerga and Iraqi forces. This created the discomfiting spectacle of U.S.-armed fighters squaring off against each other, and it highlights the delicate position in which Washington finds itself. The Kurds are secular, pro-Western, and pro-American; they are even tacitly pro-Israel. The KRG has long been one of the United States’ most reliable allies in the Middle East. It is not exactly a democracy—Barzani continues to rule even though his term expired in 2015—and it faces corruption and infighting among the KDP, PUK, and a third political party, Gorran, a PUK offshoot that campaigns on an anticorruption platform. Notwithstanding those divisions, the KRG has been an economic and political success story. By contrast, the government in Baghdad remains far more bedeviled by dissension, dysfunction, and corruption, and it is dominated by sectarian Shia parties supported by Iran. Yet Washington has supported the post-Saddam rulers of Iraq, hoping to preserve a modicum of stability in a country that is the second-largest oil producer in the Organization of the Petroleum Exporting Countries, after Saudi Arabia. U.S. administrations dating back to President George W. Bush’s have attempted to turn Iraq into a bulwark against both Sunni and Shia extremism. Their success has been limited, as seen by the swift collapse of the Iraqi military in the face of the ISIS onslaught in 2014. But, with U.S. help, the Iraqi military has been rebuilt and, with Iranian help, the Popular Mobilization Forces have become a powerful militia, with one foot in the government and one foot outside of it. 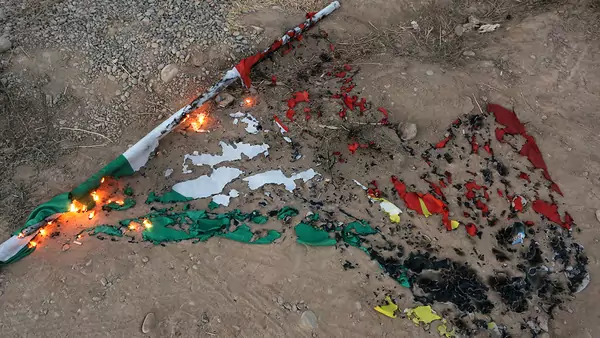 The United States’ long-standing policy has been to attempt to bridge the Arab-Kurdish divide, pressuring the Kurds not to declare independence from Iraq and the Iraqis not to use force against the Kurds. That policy appears to be breaking down, leaving the United States with a choice of attempting to maintain a neutral posture or adopting an outright pro- or anti-Kurdish policy. There is a strong historical, moral, and strategic case for supporting the Kurds. They are the largest ethnic group in the world without their own state (Kurds number roughly thirty-five million people across four countries), and they have long been persecuted minorities. Since the establishment of the KRG in 1992, Iraqi Kurds have shown themselves to be staunch friends of Washington. Indeed, with U.S. relations with Turkey breaking down, the KRG could offer an alternative to Incirlik Air Base, which the United States uses to support military operations in Syria. The KRG is eager to host as many troops as the United States is willing to send, and it is unlikely to impose restrictions on U.S. operations. Erbil’s airport is already home to a major command center coordinating operations for the U.S.-led coalition against the Islamic State. Rather than supporting independence for the KRG, the United States should push for a Bosnia-style confederation, an option that Barzani has previously indicated he could support. Such an arrangement would need to be spelled out in laborious negotiations between Erbil and Baghdad, but the Kurdish journalist Mohammed A. Salih suggests that it “could give the Kurds the ability to sell their oil and gas legally without having to go through Baghdad” and “give the Kurds a fair share of Iraq’s defense resources and more control over their foreign affairs, something that is now impossible because Kurdish representatives abroad do not have diplomatic status.” Some Shia factions in Baghdad have indicated they would be open to such an arrangement because it would allow them to consolidate control over non-Kurdish parts of the country. The sticking points would concern not only the division of oil revenues, but also the disposition of areas, such as Kirkuk and Nineveh Provinces, claimed by both Erbil and Baghdad. Ultimately their status should be determined by a binding referendum, but until such a vote is held—something that will not happen anytime soon—stopgap measures, including agreements on peshmerga pullbacks in some areas and joint control in other areas, can be reached. Success will require having an honest and influential broker. That is a role the United States is uniquely positioned to play, as long as it maintains enough troops in Iraq to remain credible (the five thousand or so U.S. military personnel in Iraq are a bare minimum) and as long as it remains diplomatically engaged. The current crisis has come about in no small measure because Washington has been distracted by the battle against the Islamic State. When the Trump administration finally focused on the KRG, Secretary of State Rex Tillerson failed to convince the Kurds to call off their independence referendum. The current crisis has come about because Washington has been distracted by the battle against the Islamic State. Going forward, the U.S. armed forces need to facilitate cooperation between peshmerga and Iraqi military commanders to deescalate tensions, while U.S. diplomats take the lead in forging a grand bargain between Erbil and Baghdad. The United States can employ its military assistance as leverage, threatening to cut off either party if it refuses to compromise, while making clear that it will help the Kurds militarily if Iraqi forces try to push into the KRG’s core provinces, Erbil, Dohuk, and Sulaymaniya. It is doubtful, however, that Secretary Tillerson, who recently had to deny assertions that he has been “castrated” by President Trump, retains enough credibility and prestige to push through an agreement. The job should instead fall to either a high-profile special envoy, such as retired Generals David Petraeus or Raymond T. Odierno or former Ambassador Ryan Crocker. The least-bad option for the United States is to continue to muddle through, working to guarantee Kurdish autonomy while keeping alive the fiction that Iraq remains a unitary state. It offers a way to paper over intractable disputes, such as the one between Baghdad and Erbil, that would otherwise result in needless bloodshed.